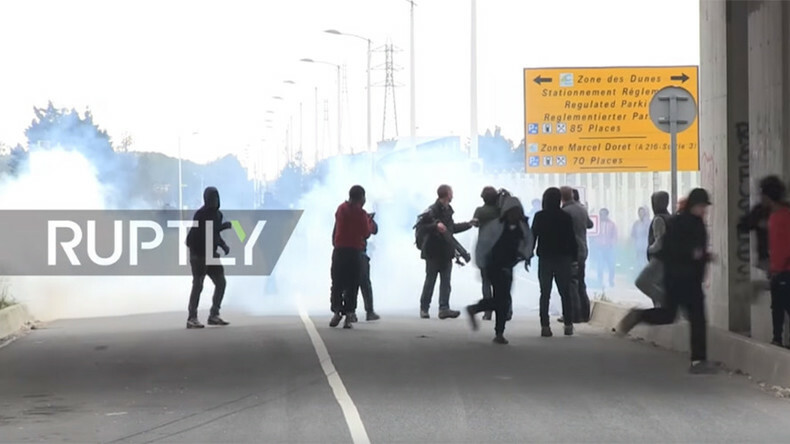 French riot police have fired tear gas at a crowd of migrants who invaded a motorway and tried to board trucks in a desperate attempt to reach the UK before the announced eradication of the Calais ‘Jungle’ camp. Clashes between migrants and riot police erupted on the outskirts of the Jungle camp after a crowd of some 200 people reportedly tried to board trucks and other vehicles heading to Britain. The police used tear gas grenades in an attempt to disperse the mob invading the motorway. 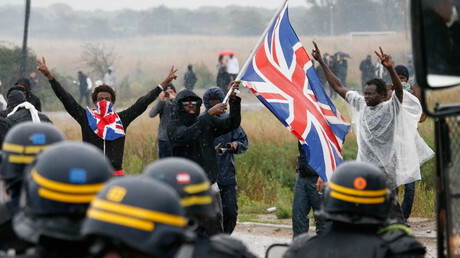 Such incidents are a common scene in Calais. Migrants try to slow traffic by putting obstacles on the road or throwing projectiles at passing vehicles. If a vehicle stops, migrants try to get in or onto it. The main targets for migrants are lorries heading to the UK, since larger vehicles are the most ‘comfortable’ for the journey. However smaller vehicles drivers are not safe either. One recent unsuccessful attempt to slow down a car resulted in the death of a migrant of Eritrean origin in Calais at junction 47 of the A16 road on Sunday night. Abraham Reichman and his father Nafthali had been driving from Antwerp to Tottenham, when their car was ambushed by a group of around 50 people, the Daily Mail reported. Mr Reichman alleged that the migrant may have had a weapon. The driver had to flee the scene, but then voluntarily went to a police outpost at the Channel Tunnel terminal to report the incident. French police reportedly interviewed the pair for three hours, the driver tested negative for alcohol and drugs and no charges were filed. The tensions around the notorious Jungle remain high, while French authorities are preparing to “completely dismantle” the camp. The camp houses between 7,000 and 10,000 people, most of whom are seeking a way to get to the UK to claim a shelter there. Aid groups and charities operating at the camp are objecting to the government's plan to dismantle the Jungle and disperse the migrants. They believe, that camp closure won’t solve the situation itself. Many believe that the exiled people will either return, or build a new ‘jungle’ elsewhere.